New NetSupport DNA mobile app delivers uninterrupted access to key IT asset data - wherever you are! London, UK – 18th August 2011 - Desktop and Asset Management software specialist NetSupport announces the immediate availability of the NetSupport DNA mobile console app – giving your IT support team and field engineers continuous access to essential customer PC data via their mobile devices. Delivering a wealth of data for the target machine, NetSupport DNA is recognised as providing one of the most comprehensive and detailed hardware inventory modules available on the market today. Compatible with Android phones and tablets, iPhone, iPad and iPod Touch, the new DNA mobile app connects with your central DNA inventory database, giving you access to accurate, up-to-the-minute asset management data wherever you are. Key features include the ability to instantly call up the current hardware inventory for the target machine; view a detailed list of any historical changes to the hardware and software, and assess the cause of any logged PC alerts. 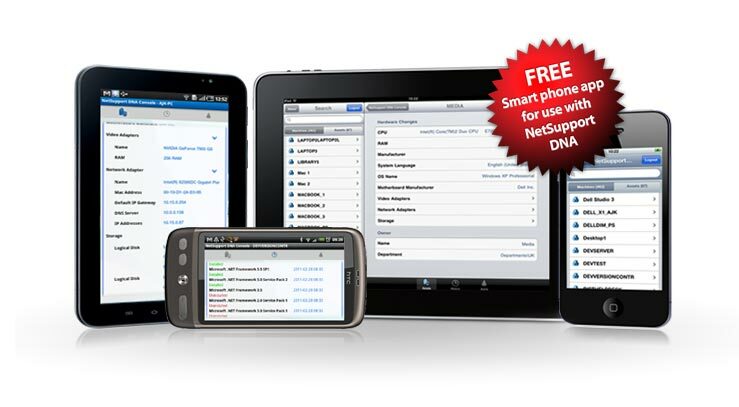 The NetSupport DNA mobile console app can be downloaded for free from the Android Marketplace or the Apple iTunes App store and is for use in conjunction with the NetSupport DNA Asset Management suite. Visit www.netsupportdna.com/mobile.asp for more information. Headquartered in the UK, NetSupport has been delivering market-leading desktop and classroom management software since 1989. Its flagship products are the highly successful NetSupport Manager remote control and PC management application; NetSupport DNA, offering advanced enterprise asset management; web-based ITIL-compliant incident management solution NetSupport ServiceDesk; NetSupport School, the leading interactive classroom and training software solution for Windows, and NetSupport Notify, its mass notification and desktop alerting tool. NetSupport solutions and their derivatives are sold worldwide and enjoy market-leading status in many countries, with an install base exceeding nine million desktops. NetSupport is recognised as one of the fastest growing technology companies in the EU and was recently awarded Education ICT Exporter of the Year at the BETT Awards, and became winners of the Network Computing awards for the third consecutive year. NetSupport is a member of BESA. Press Contact: Mr Chris Lovesey c.lovesey@netsupportsoftware.com. This press release was distributed by ResponseSource Press Release Wire on behalf of NetSupport in the following categories: Computing & Telecoms, for more information visit https://pressreleasewire.responsesource.com/about.